Chocolate Oreo Balls is an easy dessert recipe which requires no cooking. Chocolate Oreo Balls are made with oreo biscuit crumbs, cream cheese and melted dark chocolate. The Oreos are formed into crumbs in a food processor and mixed with cream cheese to further form a sticky dough. Small balls of the oreo and cream cheese mix are made and dipped into melted chocolate. Chocolate Oreo balls are then garnished with more oreo crumbs and refrigerated for a couple of minutes to harden. Once the oreo balls are hard and set, they can be served immediately, wrapped and gifted or stored for later use in an airtight container. Oreo biscuits are loved by both children and adults. The gooey dough made using oreo crumbs and cream cheese tastes and smells like a fudgy brownie and tastes delicious on its own. The no-cook dessert recipe tastes even better when dipped in melted dark chocolate. 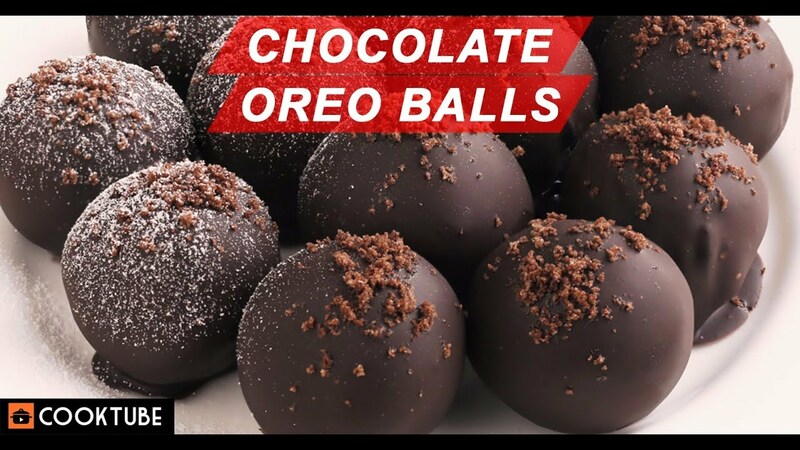 You can garnish the chocolate oreo balls with white chocolate, dust with icing sugar or sprinkle cake sprinkles over the chocolate balls according to your liking. It is also a great gifting option by packing it in a nice box and taking it to your family or friends place for gifting them. Do try this easy oreo dessert recipe and let us know in the comments below how you like it and what would you like to see next. For more recipes, visit http://www.cooktube.in/. Don’t forget to like, share and subscribe to our channel for quick no-cook dessert recipes every alternate day. Happy cooking!